Veganize it! | Save the Kales! 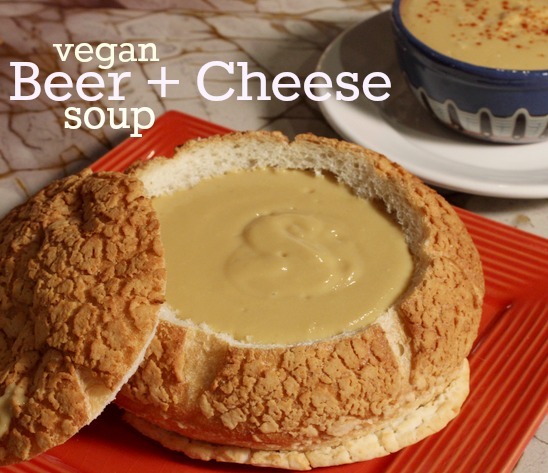 VEGAN BEER AND CHEESE SOUP: Creamy, Hearty… and Full of Vegetables!? 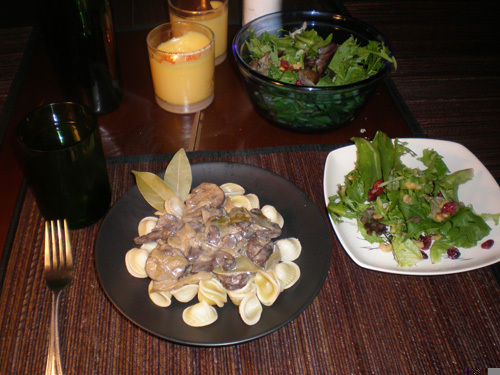 Not to toot my own horn, but this is one of my favorite recipes I’ve ever made. Ever. Believe it or not, this soup is actually quite healthful. It does contain alcohol (so I can’t claim that it’s outright “healthy”), but the entire recipe only calls for one cup of beer, among four full servings, and the rest of the ingredients are actually whole foods or spices. If it sounds impossible, I need you to 1) trust me, and 2) make this and see for yourself. Put carrots, potatoes, onions, broth/water and beer in a large soup pot. Simmer for 10-15 minutes until all vegetables are tender and some liquid evaporates. 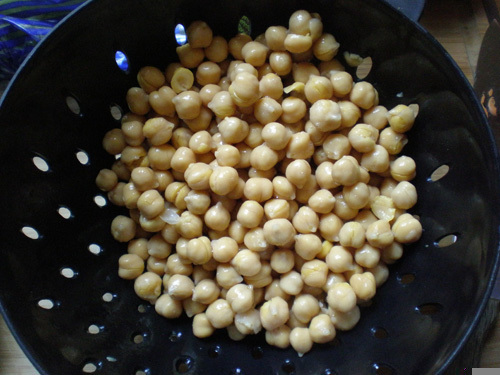 Add the beans, almond milk, miso paste and nutritional yeast. Blend well until very smooth. This will be thick, so you may need to stop and scrape the sides of the blender. 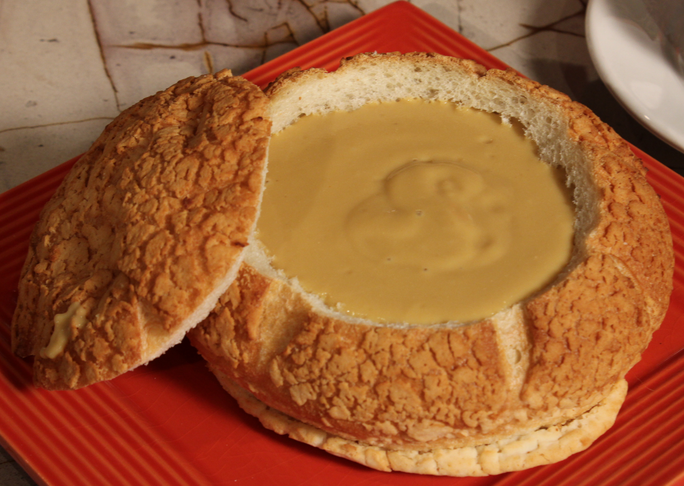 You can serve in a bread bowl, in a regular bowl, or as a dip for veggies or pretzels. Or why not try a fondue? This was part of our “Football Foods” themed episode of our half-hour vegan cooking show, Save the Kales!, airing in Pennsylvania and online everywhere. New episodes each month. Check back for our Vegan Hot Wings recipe! I think it’s beneficial for any home cook to take in recipe ideas from various sources, even if it doesn’t specifically fit your dietary needs. That’s why we get so crafty with substitutions! Or in this case, omissions. The November issue of Food Network magazine (with an unfortunate cover photo of a big cooked turkey) had an issue for a simple soup that was already healthy and easily made vegan by leaving out the chicken. 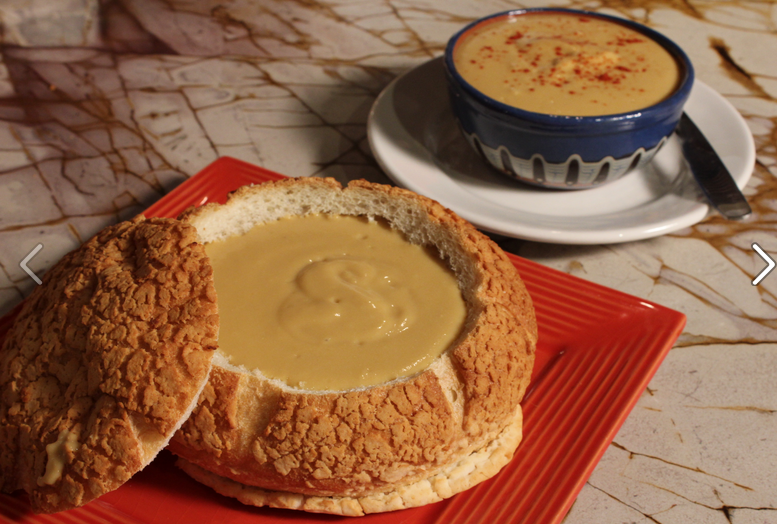 I was sitting on the couch reading the magazine one minute, and less than 30 minutes later I was eating this soup. Really simple, really fast. Heat oil in a large soup pot. 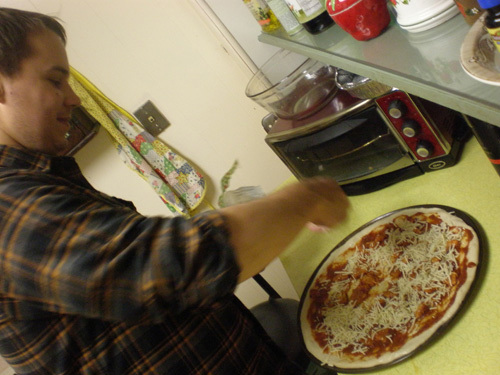 Add dried spaghetti pieces and stir, toasting them for about two minutes. 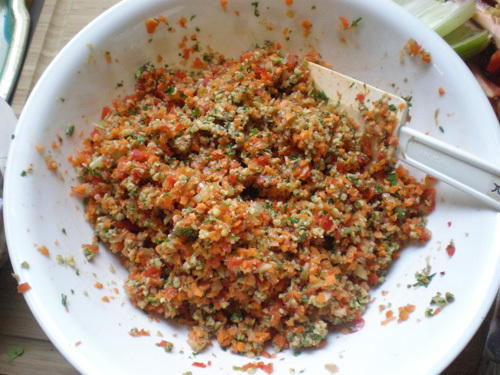 Add carrot, garlic, cumin, cinnamon, half the cilantro and cook about one minute. Add the veggie broth, chickpeas and tomatoes. Bring to a boil, then down to a simmer for about 10 minutes or until the spaghetti is soft enough to eat. 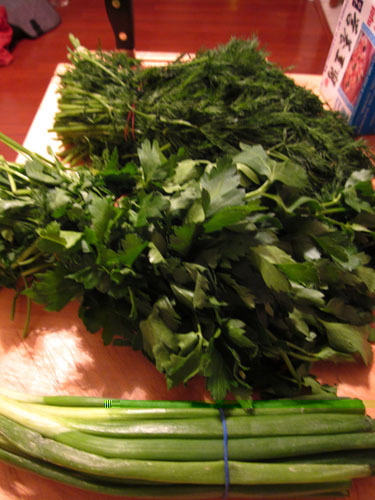 Garnish with cilantro! 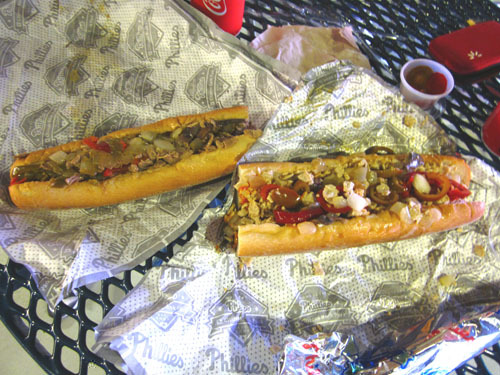 PHILLY AND CHEESESTEAKS GO HAND IN HAND. Luckily for those of us not eating cheese or steak, we can still join the party thanks to many vegetarian and vegan options all over the city! 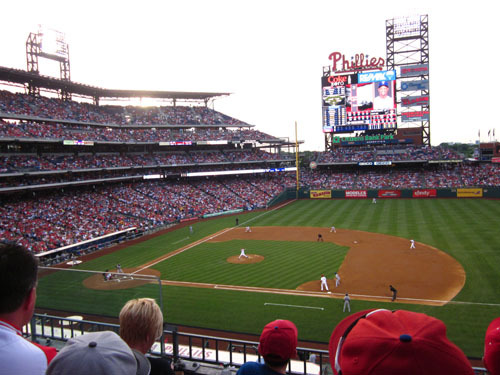 In fact, HERE is an article that explains why PETA named Phillies stadium the most veg-friendly ballpark for several years! And what a city it is! 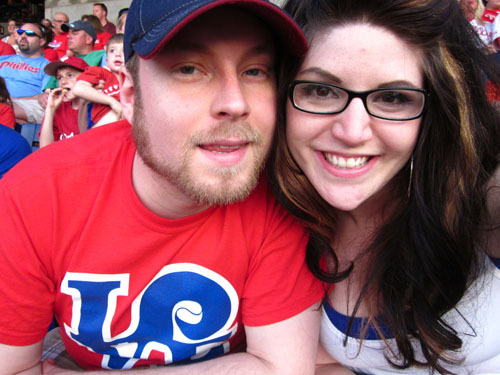 Two weeks ago Ryan and I went to Philly for an afternoon. 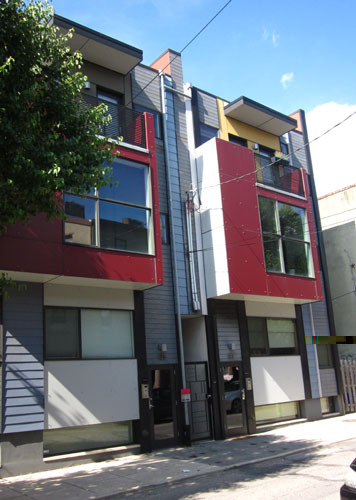 We wandered around a part of the city I’d never been to, any every single house looked like Dwell magazine’s Best of the Year issue. 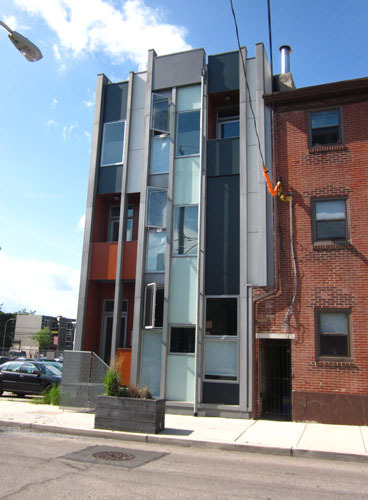 I wonder if historic Bethlehem would throw me out of town if I eventually build a home like this. I'll take one of these, please. ... And one of these. 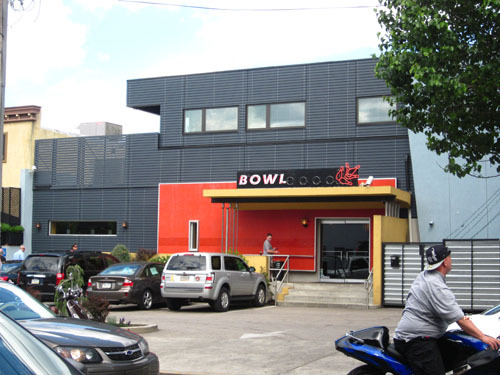 And what the heck, throw in a bowling alley for good measure. It was a hot, hot day but we had fun walking around and finding nice air conditioned places to get bubble tea, etc. 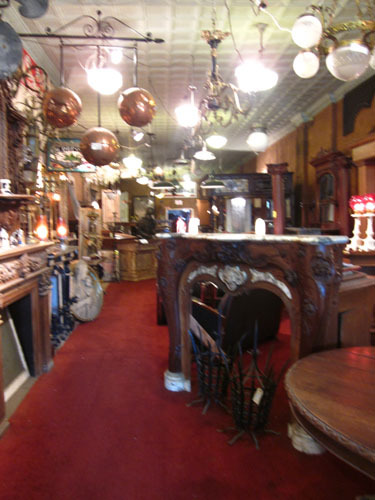 Architectural Antiques Exchange. A huuuggggeee building with salvages pieces from homes, bars, churches, etc. 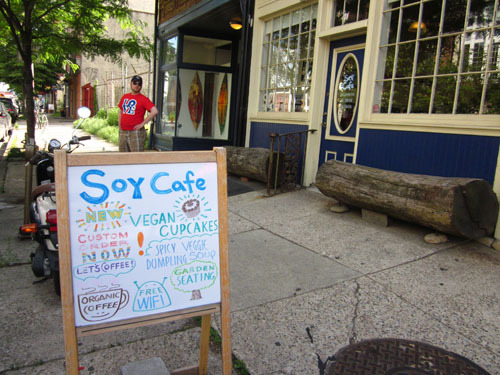 Perhaps one of the most perfect coffee shops on earth, yes? 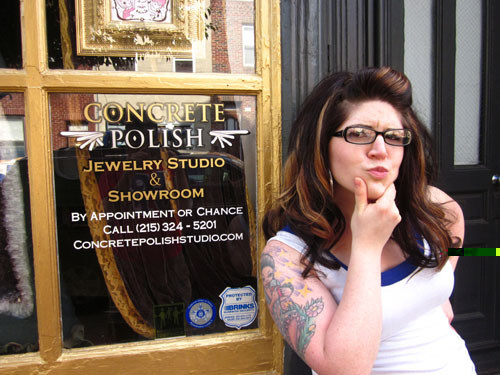 Concrete Polish? Polish, as in, all of my family has names that end in "ich" or "ski", my cat's name is Pierogi and I call one of my grandmothers "Bobchi"? 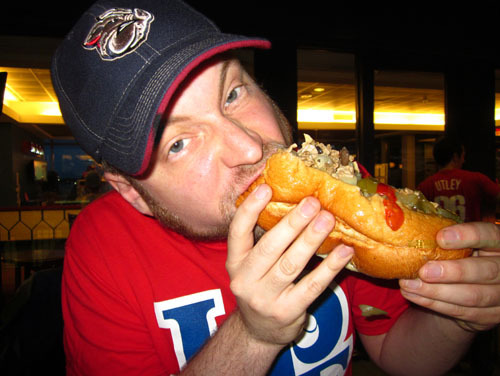 We wound our way through the most insane tailgating I have ever seen to get to the Phillies stadium. You can get VEGAN HOT DOGS there! Among other things! I am slowly but surely understanding sports. 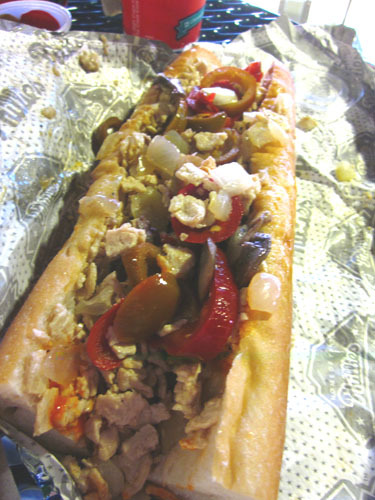 Ryan got a vegetarian cheesesteak; I got a vegan chicken steak with buffalo sauce and extra hot peppers! The fact that it was so messy meant I couldn't inhale it in five seconds and I got to enjoy it longer. That same tactic didn't work for him, though. Thank you SO MUCH to Lori and Bob, Ryan’s mom and dad, for sending us off to this game and giving us a really fun, delicious day out! 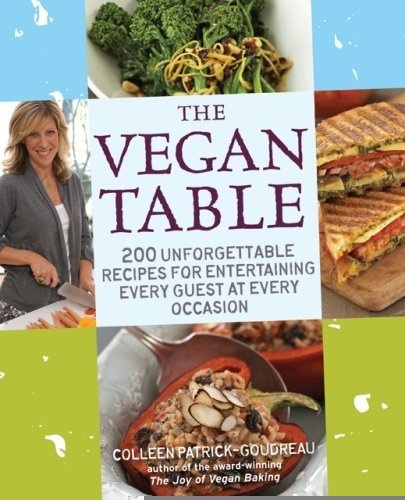 I love books like this because it doesn’t say HEY I’M A VEGAN BOOK – it’s just got a great reputation, is often recommended by family doctors and is factually sound without being too technical – so people are inclined to pick it up instead of bypassing it because it’s “that weird vegan thing”. The book can be summed up as a nutritional plan that focuses on eating as many nutrients as possible, calorie for calorie. There is SO MUCH TO SAY ABOUT THIS WONDERFUL BOOK, I will have to do a full review in another post. Until then, know I’ve been following the plan as much as possible since starting to read it, and last night made my first recipe directly from the book. 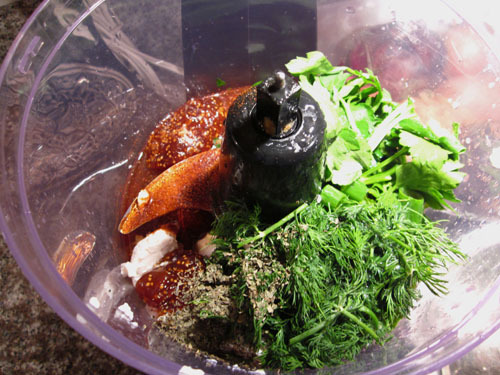 DIRECTIONS – Throw everything in the food processor. Done! 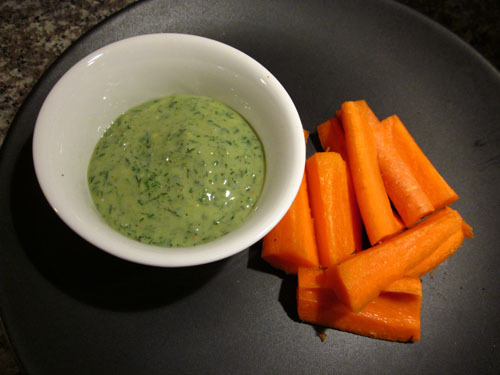 I really like this simple dip, which can also be used as a dressing or sandwich spread. There is NO FAT at all (no oils! 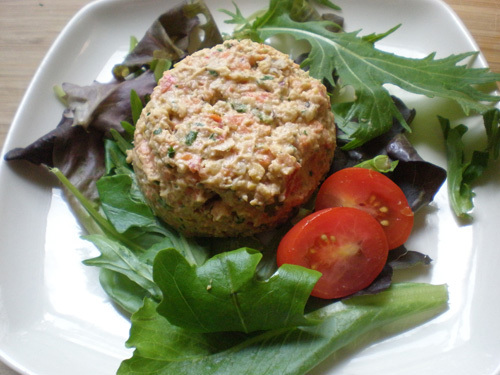 ), but there IS protein from the tofu, and the health benefits of raw herbs and garlic. 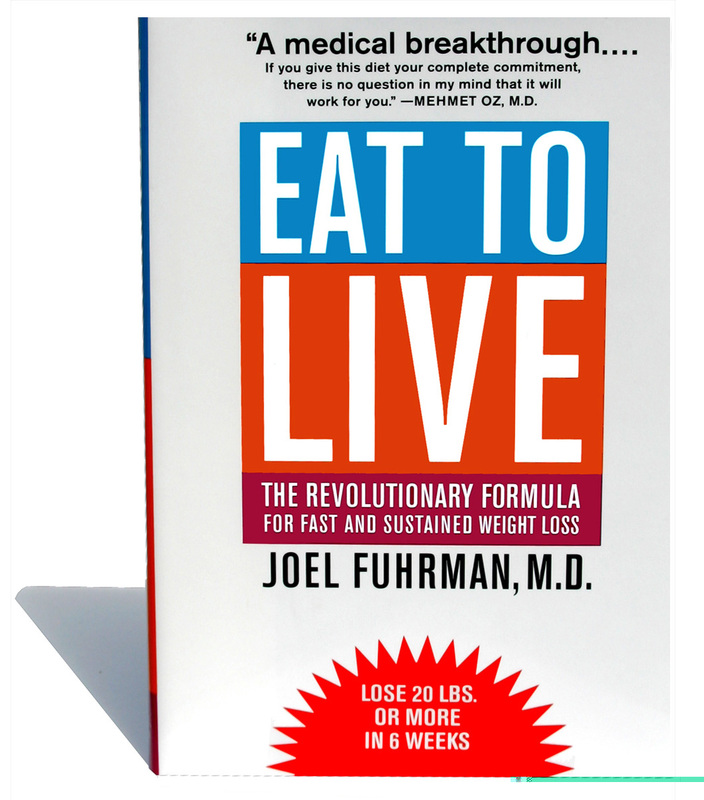 Give it a try, and be sure to check out the book Eat To Live if your body isn’t feeling as healthy as it should. NEW YEARS EVE! : What is NOG, anyway? This year after party-hopping among the homes of wonderful, creative people I settled in at my pal Alison’s colorful home for some of the tastiest vegan delights a celebrating girl could ever wish for! 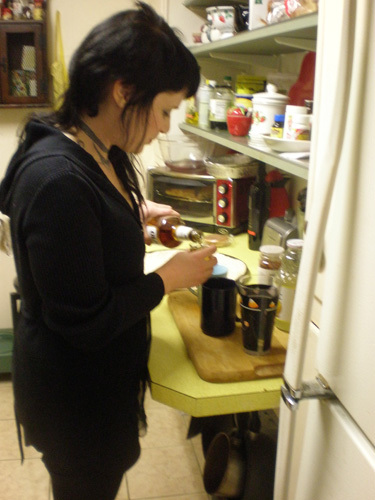 You’ll have to sit tight for this mixed drink recipe based on the Master Cleanse. No, really. Think: fresh lemonade, cayenne pepper, and various alcoholic additions like whiskey and bourbon. It was weird and awesome. Just don’t get silly and try to drink only this for 10 days. I won’t be responsible when you get fired and your partner dumps you because you’re a sloppy drunk. Let’s watch Shiner make us this most delicious, hard-not-to-inhale food. STEP 2: Add the Sauce. 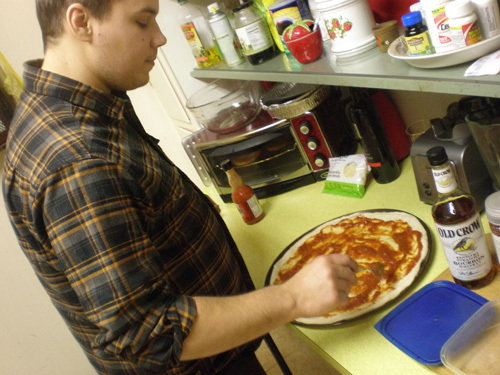 I believe in this case he used an organic jarred marinara (spaghetti) sauce. Get crafty and make your own – and if you know how to do that, invite the rest of us over so we can learn, too. STEP 3: Heat some breaded faux-chicken patties, cut into small pieces, then put in a container that has a lid. Add Buffalos Are Cute Sauce (see above), put on the lid and shake it all up til all the pieces are coated in spicy goodness. 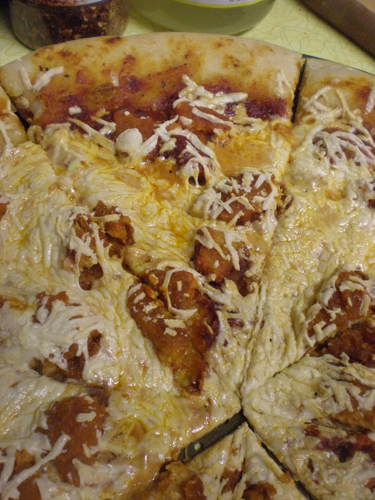 *Note: I’ve made a lot of buffalo sauce stuff with unbreaded fake chicken, but really, the breaded stuff is SO MUCH BETTER on a pizza like this. 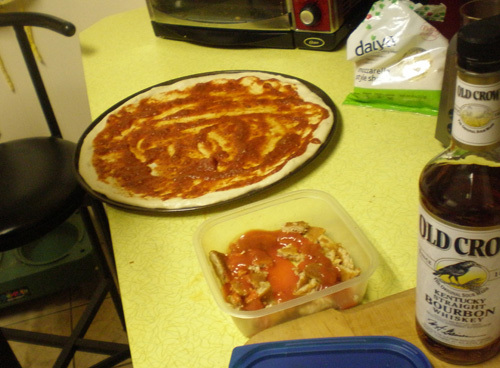 Shiner has made a billion vegan chicken pizzas and concludes that breaded faux-chicken totally the way to go. I now concur. STEP 4: Here comes an avalanche of Daiya! Daiya is still a relatively new vegan item, and has won so many accolades in the past year for being the very best metling vegan cheese ever. EVER. 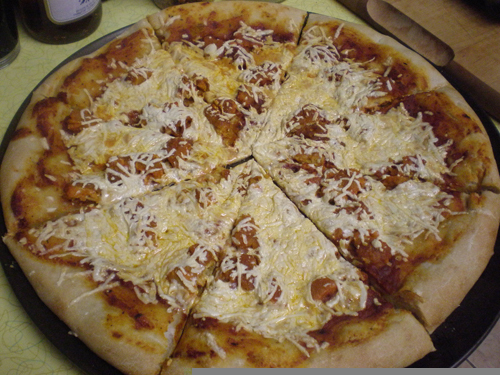 Cheddar and mozzarella flavors are available, in this case we used the latter. And check this out: 1/4 a cup of Daiya cheese only has 90 CALORIES! If you like melty cheese but hate the gas/bloating/fat/sad cows, give this a try. I would NOT recommend something that tastes bad for fear it would forever turn you off to vegan alternatives. Your mind will explode. Truth. 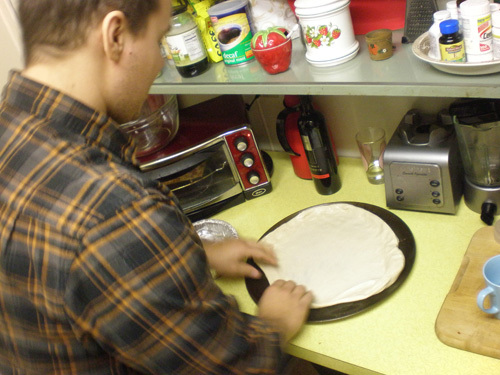 STEP 5: Bake in the oven until cheese is melty and crust is a little crispy. Try 350 degrees for about 15-20 minutes. BEHOLD THE BEAUTY THAT IS ABOUT TO FILL YOUR BELLY. I could sing Marvin Gaye songs to it all night long. That lead us all to a question that I’m still not sure I know the answer to. If you have insight, please comment below. WHAT IS “NOG”? It sounds horrible. Disgusting. Like something you cough up when you’re sick. Nog. Noggg. Ew! The internet tells me this: “Nog used to refer to strong ale in England.” That’s not good enough. I can’t believe anyone would actually, willingly call something nog when there are so many more combinations of consonants and vowels available. 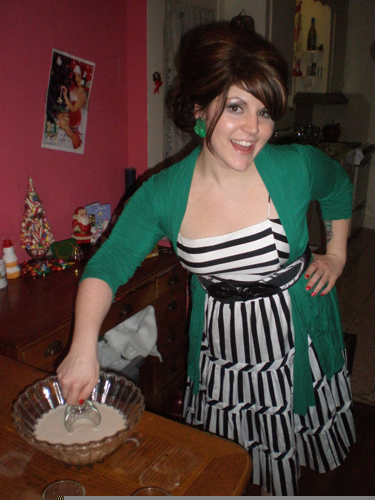 In any case, the vegan egg nog was delicious, despite the ridiculous name. In the words of my pal Melanie “2011 is going to be my year even more than 2010 was”. HECK YES. Happy 2011! 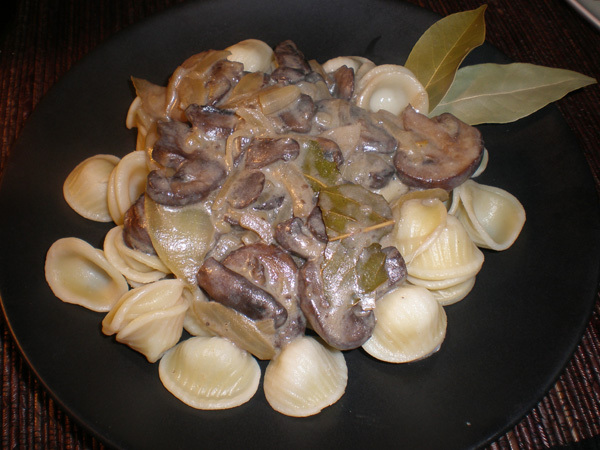 This dish is a great way to bring out the earthy flavor of mushrooms, and the creamy texture is very comforting, especially on these chilly nights! As always, this is a simple, budget-friendly recipe that will please all mushroom lovers, or maybe create new ones. 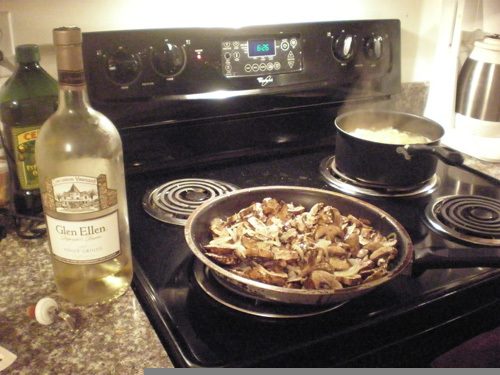 *This recipe does call for white wine, but you can omit that and just use some vegetable broth or water in it’s place. Let me also add that I bought a box of “fancy pasta” (which was on sale for a mere dollar), and it absolutely 100% made this better! 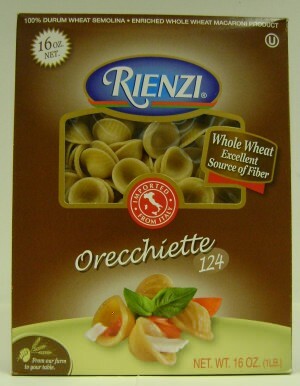 I usually always default to an inexpensive whole wheat pasta to have on hand, but trust me when I tell you – pastas are NOT created equal! A better quality pasta will take a dish from good to GREAT. Cook the pasta and set aside. 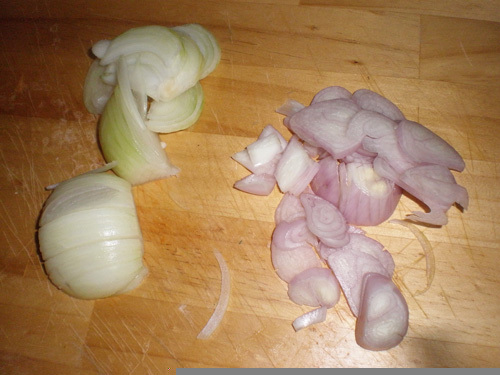 Cut the onion in half lengthwise, put flat side down, and run knife through onion to create half-moon slices. Do the same with the shallot. 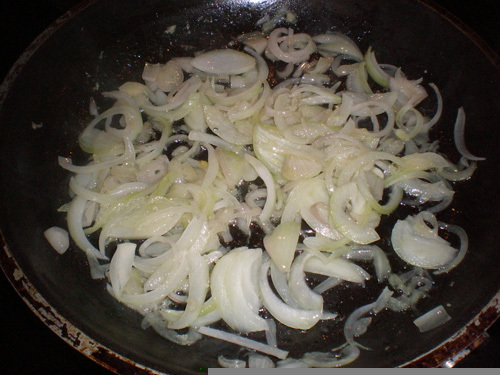 In a large skillet or pan, heat enough olive oil to coat the bottom, and add onion and shallots. Reduce heat to medium-low. Onions and shallots should get soft and translucent, not brown. Add grated garlic and mushrooms. Add white wine and turn heat back up to medium, stir and heat through. Heat up the almond milk in a mug before adding to the pan (or else it will be really cold and cool down the pan! ), and stir in. Let everything bubble and simmer. 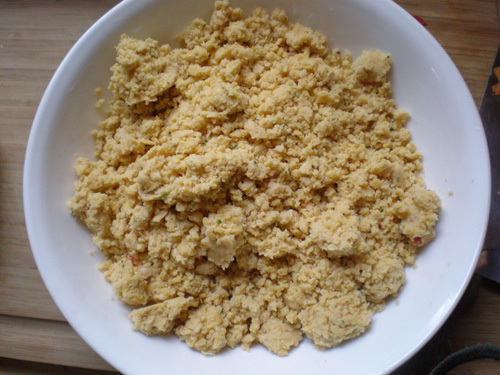 Add bay leaves, nutritional yeast and flour. 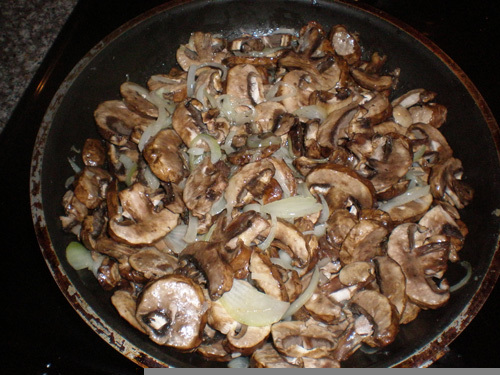 Use a whisk to stir the dry ingredients into the pan, making sure there are no lumps stuck to the mushrooms. Turn heat back down to a low simmer. Stir every few minutes, and sauce will thicken. 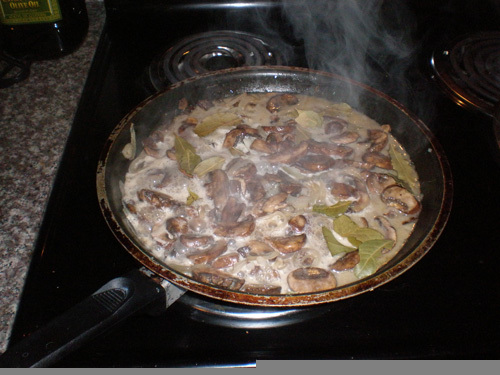 Add pasta to the pan and stir together, or spoon mushroom mixture over plated pasta. Salt to taste! Play around with the flavor by adding your favorite herbs. I hope you enjoy this easy, “meaty” and “creamy” dish!